Genesis Casino is a brand new online casino with an international presence in the UK, EU, and South Africa. Launched in 2018, the Casino is owned by a Malta-based company and has licenses from the gambling authorities in both Malta and UK. It has a massive selection of games, powered by the Titans in online casino gaming like NetEnt, Evolution Gaming, Yggdrasil, and Microgaming. This is an instant play online casino based on a web-browser platform. You can play your favourite games at Genesis casino using a PC/Mac or any mobile device with an internet connection. While it has a global reach, Genesis Casino has a special landing page exclusively for South Africa players. It fully supports SA banks and accepts deposits and withdrawals in Rands. Even customer care has a dedicated South Africa toll-free number. If you like the idea of winning millions of Rands while playing progressive jackpots, log into Genesis Casino now! Older online casinos had pretty complicated designs. You often had to jump through several hoops if you wanted to play on anything other than your PC or laptop. Even on PC, many casinos depended on download of client software, which was a hassle and not very safe either. But Genesis Casino belongs to a new breed of online platforms with a more streamlined execution process. A single software platform, it is equally compatible with all major devices, including PC and Mac computers, as well as all mobile OSes like iOS, Android, Windows, and Blackberry. This allows you to play on multiple devices using the same account. All you need to do is enter your login ID and password whenever you open the casino on your PC or mobile. You can play while at home, or even when you are travelling! All Android mobiles and tablets like the Samsung Galaxy Series, the Google Nexus devices, Motorola Moto G/X series; all Windows phones; and Apple Devices: including both iPhones as well as iPads, starting from the old models like iPhone 4S and Pad 2, to the latest iPhone X series. All the actions you perform on the PC version are also available on the mobile version of Genesis Casino. You can play the same games smoothly on the smaller screen, deposit money, wager, and even withdraw your winnings directly from your mobile device! At Genesis Casino, the excitement begins right when you sign up and make your first deposit. This is when you become eligible for the first in a long line of bonuses and other exciting offers. As part of the Welcome Offer, a new player is given 100% matching bonus when he/she makes the first deposit at the casino. This bonus can go as high as R1,500. And that is not all, the bonus continues to build as you play more at the casino. For your second deposit, Genesis offers up to R4,500 as matching bonus, at 50% your deposit amount. And it doesn’t let up when you make your third and fourth deposits either. You are still eligible for a max bonus of R4,500 on these transactions, with a matching percentage of 25%. In total, you can claim a grand total of R15,000 as matching bonus. Before we forget, the Welcome Offer also includes 300 Free Spins on a slot game, like Starburst! Weekly bonus Mission: every week, you can earn up to R1500 on Fridays as part of this bonus offer. All you need to do is deposit and wager R750 between Mondays and Thursdays. You will get a 25% matching bonus on the amount you play with that week. Monday Free Spins: As part of a promotional offer called “Lightspin Mondays”, Genesis offers you free spins on their popular video slots games each Monday. For this to happen, all you need to do is wager R150 over the weekend at the casino, between Thursday and Sunday. Shooting Star Bonus: this is an amazing standalone bonus worth R3000 that you can claim any time you don't have an active bonus. And all it takes is a deposit of R150 to make it happen. Simply select this bonus option when you make your deposit and enjoy! You will never get bored at Genesis Casino, and that is a guarantee. There are simply too many games to choose from here. Latest estimates suggest that the current tally is somewhere close to the 1300 mark. And those are all unique games, from some of the best software providers out there, like NetEnt, Evolution Gaming, Quickspin, Play’N Go, Red Tiger & ORYX. Genesis casino is all about quality as well as quantity when it comes to the games. Take the progressive jackpots for instance. Games like Mega Moolah and Gunslinger have pots that keep growing the longer it goes without a winner. It is not unusual to see jackpot wins that exceed R150 million at these games. And you could be a winner too! Video Slots: there are close to 800 slots games available at Genesis Casino, with top titles like Starburst, Twin Spin, Vikings go Berserk, and Sakura Fortune drawing thousands of players. You can find both 3-reel as well as 5-reel games here. Live Casino: the lobbies at Genesis Casino are very diverse, with special rooms for English, German, Swedish and French-speaking players. You can find both high and low stakes games of Blackjack, Texas Holdem, Roulette, and Baccarat. Table Games: if live lobbies are not your thing, you can try for a more relaxed gaming experience in this section of Genesis Casino, filled with baccarat, blackjack, roulette, and video poker. Funding your account with Rands was never this easy! At Genesis Casino, players are welcome to choose from methods like Online Bank Transfer, Visa, MasterCard, Skrill, Neteller, and ecoPayz, EasyEFT and more for all your deposits and withdrawals. The support system at Genesis is simply world class, no other way about it. There is 24x7 customer care in the form of Live Chat, and this is available all through the year. For more detailed queries, you can shoot them an email at [email protected], and they will get back to you in short order. If you prefer calling instead, they also have a toll-free number for South African players, which is a nice touch. The number is 0800992824, and it is available during daytime office hours. 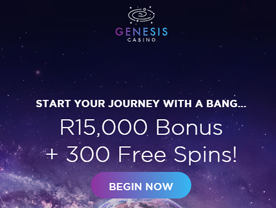 If you are a South Africa player looking for a reliable online casino, do yourself a favour and go to Genesis Casino. This is one establishment that actually cares about its clients and goes to great lengths to make sure that all their needs are met. You will have a great time at Genesis Casino with its selection of amazing games, excellent customer care, and exciting bonuses that keep on giving!